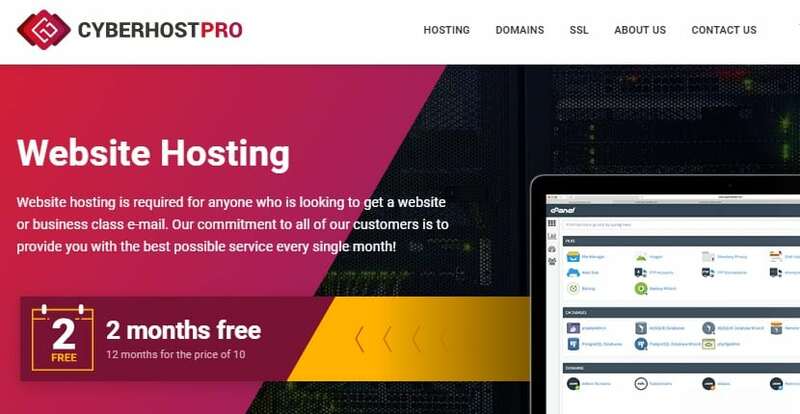 Cyber Host Pro Review 2019: Is Cyber Host Pro a Good Hosting? Cyber Host Pro is a U.K.-based web hosting provider that focuses on providing hosting solutions with 24/7/365 live chat support, so customers always know help is around the corner. Their solutions are powered by Dell servers housed in data centers across the U.K.
Cyber Host Pro is a small website hosting provider based in the United Kingdom, but their customer base has expanded beyond national borders to countries such as the United States, Germany, France, and India. This vendor offers simple shared web hosting, but can also scale up to regular virtual servers, cloud-based VPS, reseller hosting, and dedicated server plans. The company has been operational since 2002. CloudFlare CDN – This is widely recognized as one of the best CDNs in the industry. Having a CloudFlare CDN means better website loading speeds for your readership, no matter where they’re located around the world. Website builder – This beginner-friendly tool enables you to quickly design and launch a website without any coding knowledge. Daily backups – Many web hosting providers only offer weekly backups — and some don’t offer any at all. Cyber Host Pro offers daily backups with an easy restore tool. LiteSpeed Web Server, CloudLinux OS, and MariaDB – This power-packed combination of software is highly-regarded in the industry as one of the most optimal configurations for delivering fast speeds and guaranteed resources to shared hosting customers. There wasn’t much that I didn’t like about Cyber Host Pro’s packages, given the effort they’ve clearly invested into decking out their servers with the best software in the industry. However, I do have one complaint: their entry-level shared hosting package only gives you a single MySQL database. This means that if you install WordPress on your account, you have no other databases to work with in the event that you’d like to install any other database-driven scripts. Cyber Host Pro doesn’t have an uptime guarantee readily advertised on their website. It took a little bit of digging before I finally found it, but it appears that they do have one. Unlike most vendors, they don’t offer the typical 99.9% or 99.99% uptime guarantee; instead, they guarantee that if your website is down for more than 0.72 hours in a month (which works out to be about 43 minutes), they’ll refund credit into your account. While Cyber Host Pro has a relatively cheap basic web hosting package, it comes with a low resource cap and would therefore limit most growing websites. For business owners who want a better hosting deal from this vendor, the only way to achieve this is by subscribing to the more expensive packages. The problem is that even those more expensive plans do not include unlimited disk space, domains, emails, and other features that most enterprises would find imperative. The truth is, there are many other reputable U.K. hosting providers with cheaper and just as robust web hosting solutions. That said, Cyber Host Pro offers customers two free months of hosting when you subscribe to their annual plan, so while they aren’t the cheapest, they definitely aren’t the most expensive, either. Cyber Host Pro has a friendly support team on standby 24/7/365, ready to solve any challenges their customers face. This team is quite resourceful and has an average response time of 30 minutes for tickets. The best part about their support is still their live chat, however: this connects you to a real live agent in under a minute and is available 24/7/365. This appears to be the channel that Cyber Host Pro wants to funnel most of their customers to, and for that reason they don’t have a telephone number you can call. Cyber Host Pro also has a comprehensive knowledge base that includes video tutorials covering a range of topics. onClick="trackClickout('event', 'clickout', 'Vendor Page - Visit User Reviews', 'Cyber Host Pro', this, true);"
I have a cloud instance on their new UK network and it performs as well as AWS & Vultr instances. Would highly recommend as a high quality & more reliable network in the UK that still has easily deplorable instances.The communication from them has also been great. Cyber Host Pro is a particularly ideal choice for small and medium-sized businesses who need a reliable, all-inclusive hosting solution with a support team always on standby. However, their shared hosting solutions are not the best for those wishing to host multiple websites. Wondering how Cyber Host Pro stacks up against other Web Hosting companies? Enter any other Web Hosting company and we will give you a side-by-side comparison.